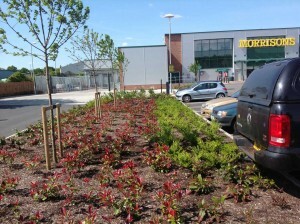 Hydrogeo were commissioned to undertake the Remediation Verification role at the new Morrisons store located off East Somerset Way, Wells, Somerset. The site was formerly operated by Clares Merchandising Group (CMG) as a manufacturing and finishing works of specialist trolleys. The company was Britain’s largest manufacturer of specialist trolleys with one of the largest in-house zinc-plating plants in Europe which allowed production of the high quality zinc-coated products. The factory was operational from the 1960s until 2007 when CMG went into administration. The works comprised a number of disused, interconnecting industrial units with external areas of concrete, hard-standing with some peripheral areas of soft landscaping. 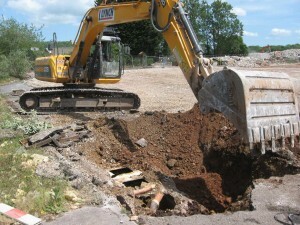 Hydrogeo attended site and verified removal of known and previously unknown contaminant hotspots. Our specialists liaised with the project team and regulatory authorities in order to ensure that the project progressed in accordance with the regulatory approved remediation strategy. Where out of specification materials were identified the team engaged with the regulator in order to agree the implementation of a materials retention plan, leading to significant project savings to the overall development. 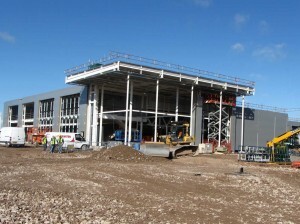 Works concluded with the production of a Remediation Works Verification Report which was issued to and approved by the Local Authority enabling a store opening in December 2012. “Just a note to say many thanks for all your work on the verification of the remediation at the former Clares Merchandise Handling Equipment Factory, which is now the new Morrisons site in Wells, Somerset. I particularly appreciated your early introduction call before the work even started and your continuous contact throughout the process. You were always available to call and actually did report the unexpected contamination as required by the planning conditions which many consultants fail to do so.